Delight your loved ones with this Embracing Pureness Flower Arrangement and make them realize how special they mean to you. This bewitching Bouquet is the combination of 9 Carnations, 9 Red and Pink Roses and filled with Filler Flowers tied with Ribbon and set in a Glass Vase. Delight your loved ones with this Embracing Pureness Flower Arrangement and make them realize how special they mean to you. 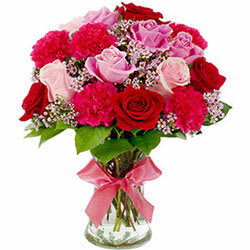 This bewitching Bouquet is the combination of 12 Carnations, 12 Red and Pink Roses and filled with Filler Flowers tied with Ribbon and set in a Glass Vase.